Happy Halloween! Today, I have a festive card to share using Lawn Fawn stamp sets and die. 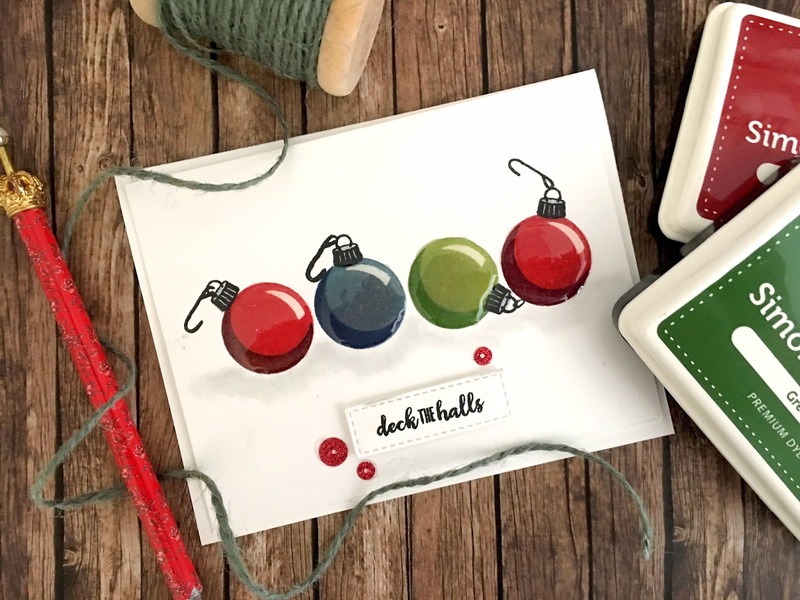 I wanted to create a fun, festive, simple card using this Lawn Fawn stamp set that I have really not used since getting it upon release. My favorite costume in this Costume Party set is this little dinosaur guy. And (you know how much I love puns) the set comes with the word stamp 'Rawrsome'. YES! I didn't use that one on this particular card but I plan on using it soon. 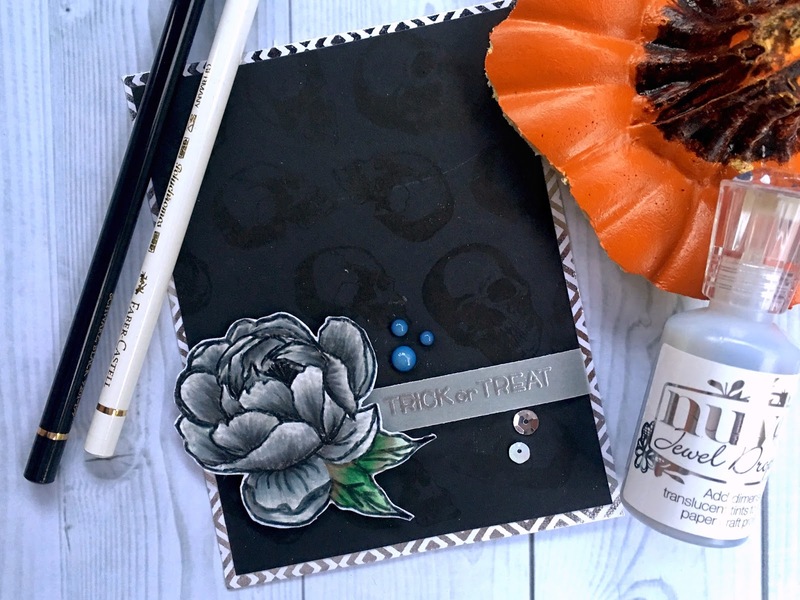 I knew that I wanted to use this stitched tree die from Lawn Fawn as a background to my little trick or treaters, but the moon was a last minute decision. I used a simple circle die and cut it from white card stock. I had thought about using yellow but I thought it may look a bit like the sun so I decided against it. I adhered both of these die cuts to a A2 sized piece of Toned Gray card stock with double sided tape and used Multi Medium Matte on the very tips of the trees. Looking back I think I would have omitted the white gel pen "stars" that now look a bit like snow to me. 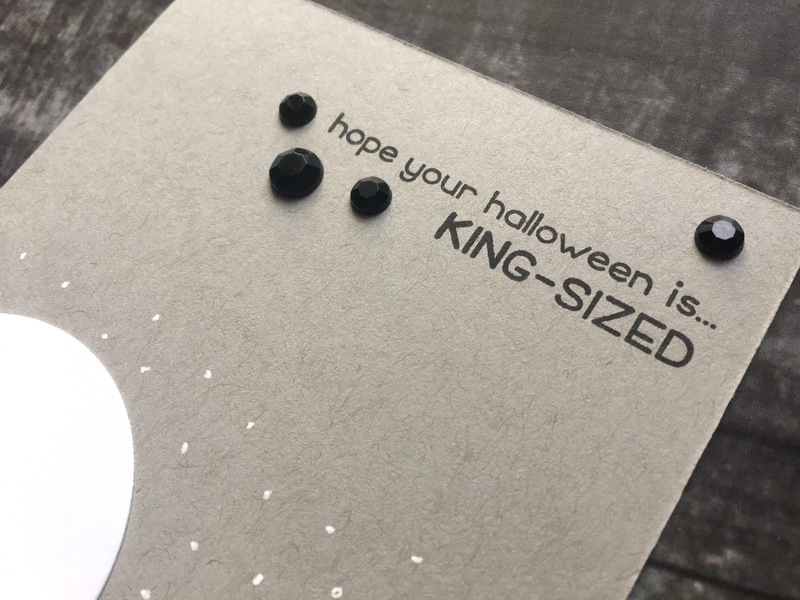 I then had to think of my sentiment and ultimately settled on I hope your Halloween is... King Sized. I thought it fit nicely to the scene since they're holding the King Choco bar. I colored them in with Copic Markers. 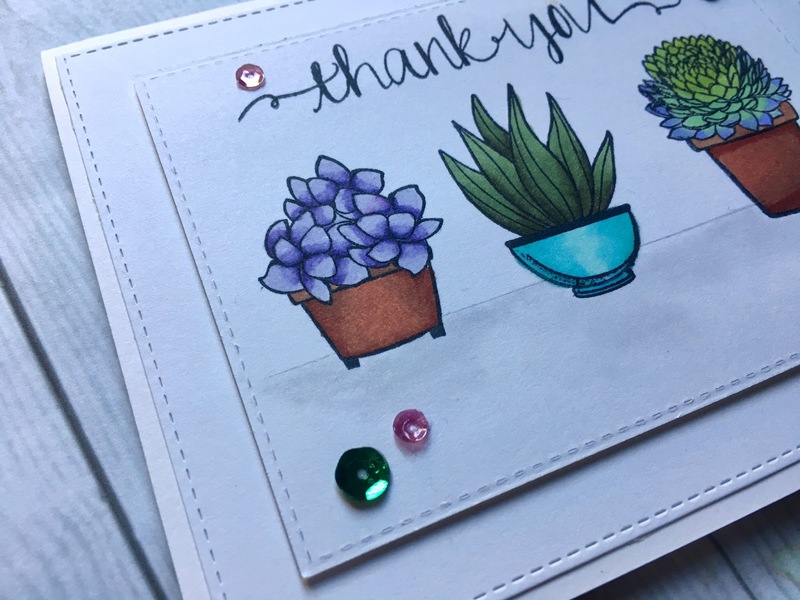 I wanted to keep the card simple so I stamped the sentiment directly onto the card front in Versafine ink, and accented it by adding a few black gem embellishments. I hope you truly do have a KING SIZED halloween. 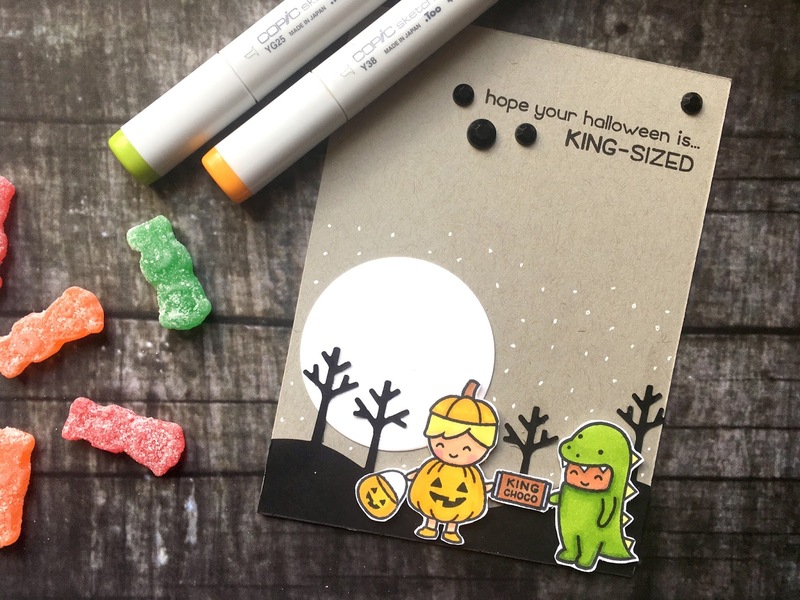 Eat some candy, watch some spooky movies, (maybe a little crafting?). Enjoy! Happy Halloween! A very good friend of mine has a super exciting day coming up. Her daughter, who has been in the NICU for three months after a very early preterm labor, is coming home on Monday! Elaina is easily the strongest, most determined little babe I have ever had the pleasure of meeting. I can't wait for the three of them to be together in their home. When Gina asked me to make the Thank You cards for her nurses I was thrilled. 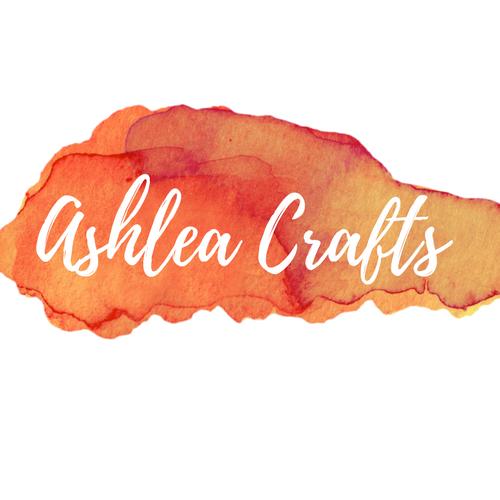 For one, I finally had an actual reason to make cards rather than just because it's an addiction of mine, and because it's a really nice feeling when someone is confident enough in your work to ask you to create things for them. Pretty cool. I knew I needed to keep the card a bit simple. I had to make 6 of them so it needed to be a design that I could create over and over, but also one that was beautiful yet not too time consuming. Gina also wanted the sentiment "Thank You For Helping Me Grow" and asked if I could include some plants or flowers. I thought that was just the cutest idea and I really can't take any credit for it. But i don't own a stamp set with the sentiment "for helping me grow" so I ordered this one from Wplus9, but it didn't get here in time. Processing time really stinks sometimes! No worries! 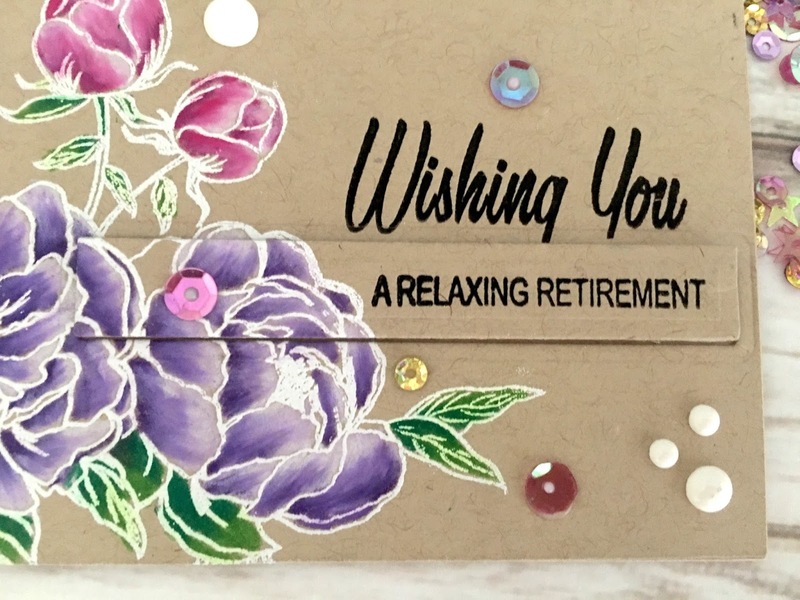 I just created the sentiment on the inside of the card using letter stamps. Work with what ya got. I cut two stitched rectangles of varying size out of white card stock to create the biggest size 5.25X4". Just slightly smaller than an A2 size card. I stamped the succulents into the smaller rectangle and I colored the succulents and pots in with Copic markers. 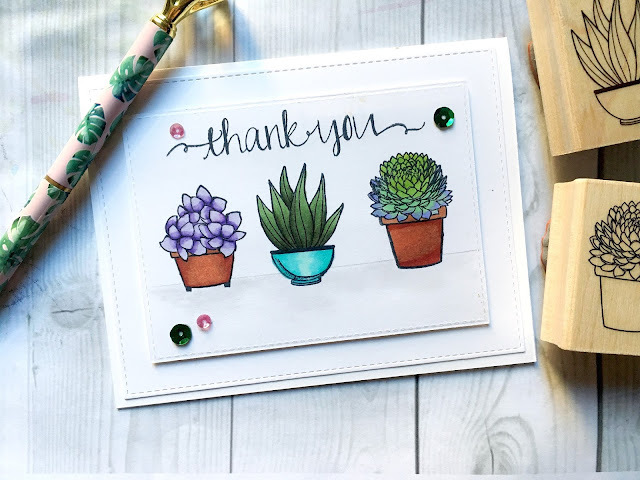 I then stamped the Thank You from Avery Elle's Oh Happy Day set above the plants and shaded below the pots to give a bit of dimension to the piece. 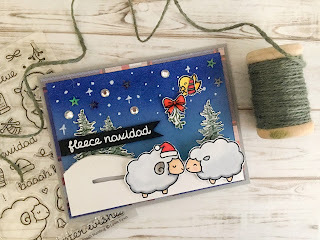 I created a top folding card base in an A2 size, and used a tape roller to adhere the larger rectangle while using foam tape to pop the center rectangle up a bit. To add a little sparkle (of course) I added just a few complimenting green and purple/pink sequins. I hope that Elaina's nurses will love these cards as much as I loved creating them! Thank you for stopping by. See you soon! This is my second card for my multi-use "complimentary" stamps challenge. 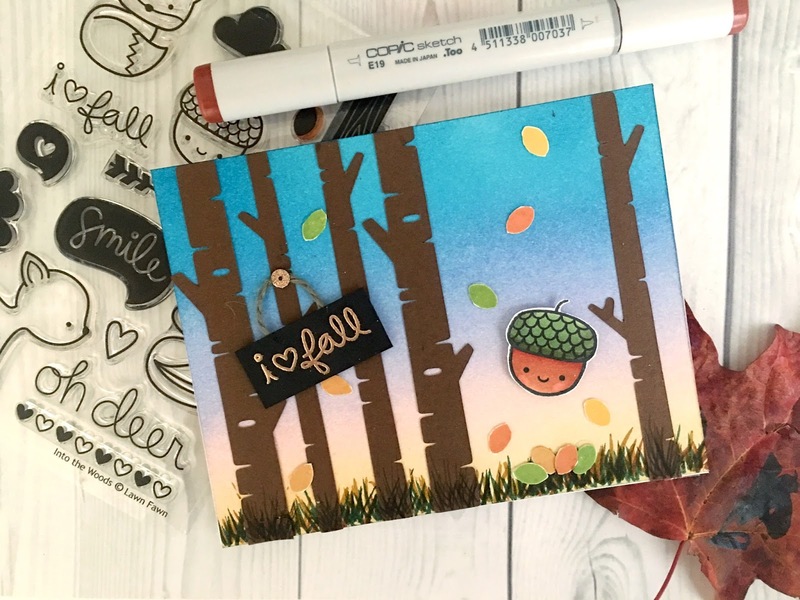 For this challenge I use only the smaller, non featured stamps in any stamp set to make an entire card. It's a good way to get extra uses out of certain stamp sets that you may not have thought to use over and over again. 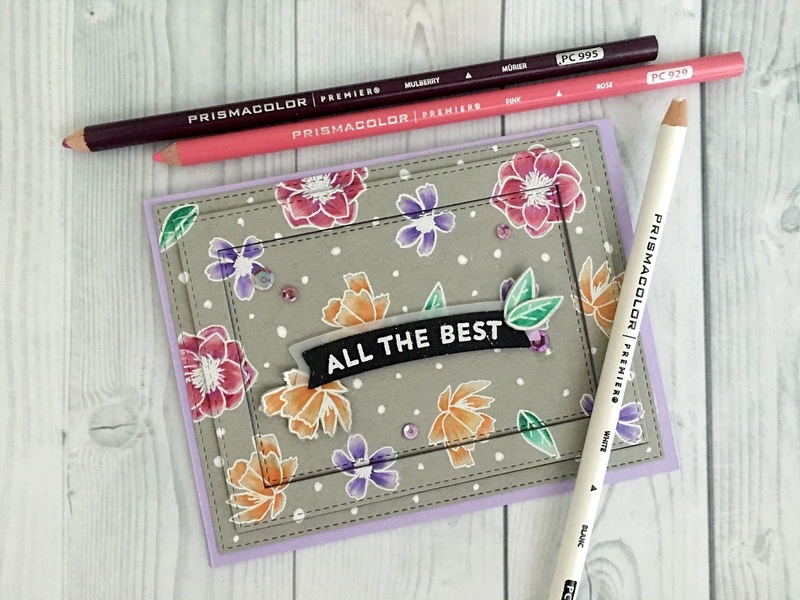 This card uses only the small flower and leaf stamps in the Concord & 9th Pineapple Perfection stamp set. This stamp set features a gorgeous, giant pineapple made up of flowers with filler stamps to stamp color into each flower. It also includes a few flowers that can be colored in and die cut to add some dimension. I decided to use only these stamps to create this card. I started by stamping the flowers with VersaMark ink in a random pattern around the Strathmore Toned Gray card stock. I then heat embossed the flowers in white embossing powder to help them stand out against the darker color. I love using colored pencils to shade in floral stamps on top of darker card stock. It gives such a striking look. I used pink, purple, and orange tones and blended them with a white pencil to give a nice faded appearance to the petals. Because I wanted to give a bit more interest to the card and pattern, I cut two varying sizes of stitched rectangles using the MFT Stitched Rectangle 2 set. This cut my card into three pieces with the largest being 4X5.25". Slightly smaller than an A2 card. I decided to place foam tape behind the thin framed piece that was cut and adhere the other two pieces with double sided tape. This keeps the pattern and images intact while giving dimension and interest to the card. It also made a nice place to put my banner with the sentiment All The Best, also from the stamp set. Though you could use any sentiment you see fit. I adhered a piece of vellum paper behind the banner to add some softness to the black card stock. I then cut two leaves and placed them on top of the banner. 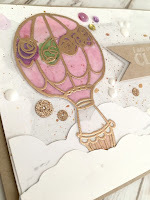 I used Simon Says Stamp Lavender card stock for my base cut to a standard A2 size. I thought this purple color really tied all of the flowers together and I also love purple and gray paired together. 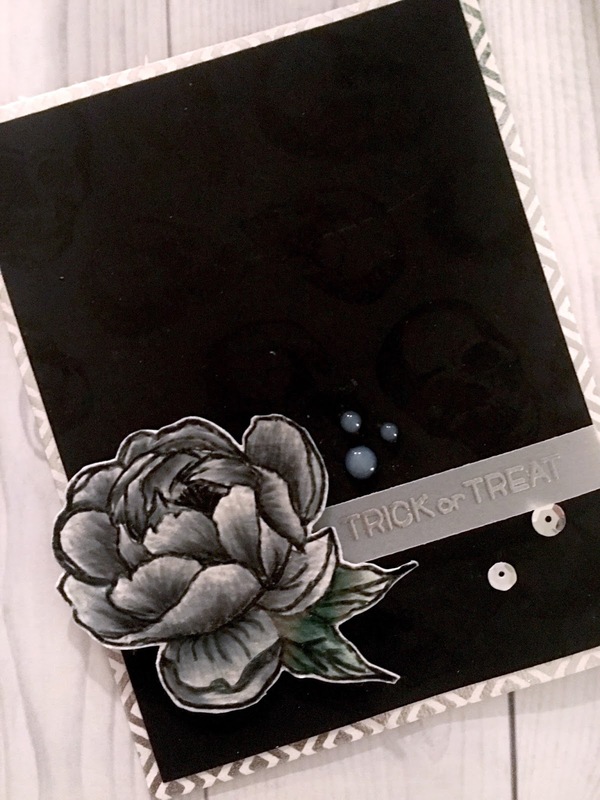 Then to fill in the spaces between the flowers, I used a white gel pen to draw some dots randomly around the card. 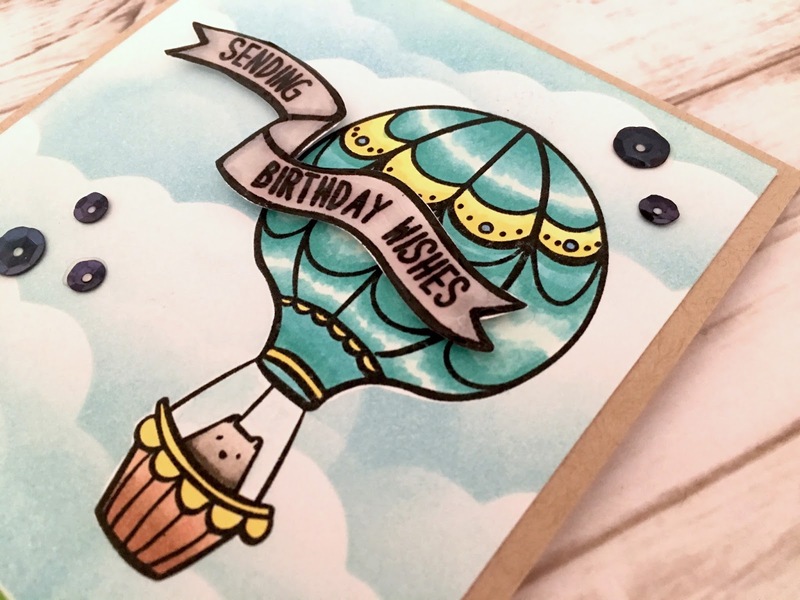 I hope this gave you some ideas to create your own card using some stamps you may not have thought to use before. Thanks for stopping by. See you soon! If you're anything like me, you make a lot of cards. Many of them...okay, MOST of them for no particular reason. I tend to try to use as many stamps in a particular stamp set as possible, for whatever reason. Maybe because they're all so well coordinated? I'm not quite sure. Anyway, I thought, wouldn't it be great if I could make an entire card using just one or two stamps in an entire set? That would give me so many more uses for just a single stamp set. Furthermore, what if the stamps I did decide to use were the lesser featured stamps? You know, the complimentary stamps rather than the main stamps. So enters my newest challenge. Lawn Fawn makes the BEST critters.They have perfected the art of cute. And the thing with Lawn Fawn is that even the complimentary stamps, as we're calling them, are too cute to leave out. So I pulled out my Into The Woods set and decided to feature this adorable little acorn. It would be easy to overshadow this little guy with the deer and the Oh Deer sentiment, or the adorable fox, or raccoon, but not today. 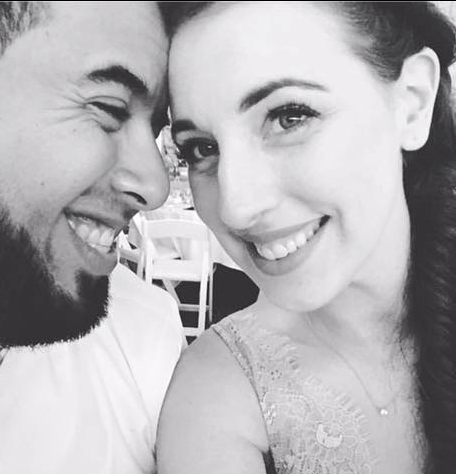 Today is your day, Mr/Mrs. Acorn! First I used Distress Inks to blend the sky. Honestly, I wanted the look of a sunset but I feel this looks more like a sunrise. I'm okay with it, though. I think it looks like cool weather almost. 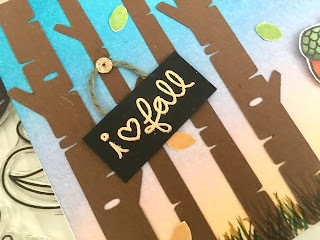 After drawing the grass with Tombow markers, I die cut these gorgeous trees from the Lawn Fawn Birch Trees die set in a brown Neenah card stock. I also used the leaf stamp from the set to make the fall leaves. I arranged them in a pile beneath the "falling" acorn. 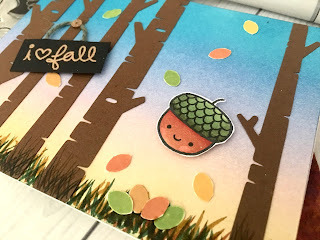 I *hope* that I achieved this falling look by adding the leaves above the acorn as well. I couldn't immediately think of a way to accent my sentiment. I embossed the I <3 Fall sentiment in Ranger Gold Embossing Powder on black card stock and cut a few different sized banners out around it. Nothing was quite working. After a little brainstorming, it hit me. When you're creating a scene like this, it's important to use the surroundings you've crafted. In this case, I did so by making a sign out of my sentiment. I adhered a piece of yarn to the backside of the "sign" using Multi Media Matte and then adhered that with the same glue to one of the trees. I did so a bit crooked to draw some attention to it and to make it look man made and imperfect. I needed a nail, so I glued a sequin to the spot where the yarn met the tree to give the illusion that it is hanging there. I don't have the most confidence in myself when it comes to creating scene cards like this one. Creating little challenges like this gives me a clear goal which is helpful when designing and brainstorming. Let me know if you've decided to try something like this and how yours turned out! Thank you for reading! When card making friends send you a gift you make a thank you card, of course! 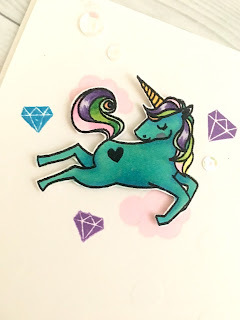 I wanted my thank you card to be a little different than the traditional so I dug deep in my stash and found this Recollections unicorn stamp set that I've had for quite some time. 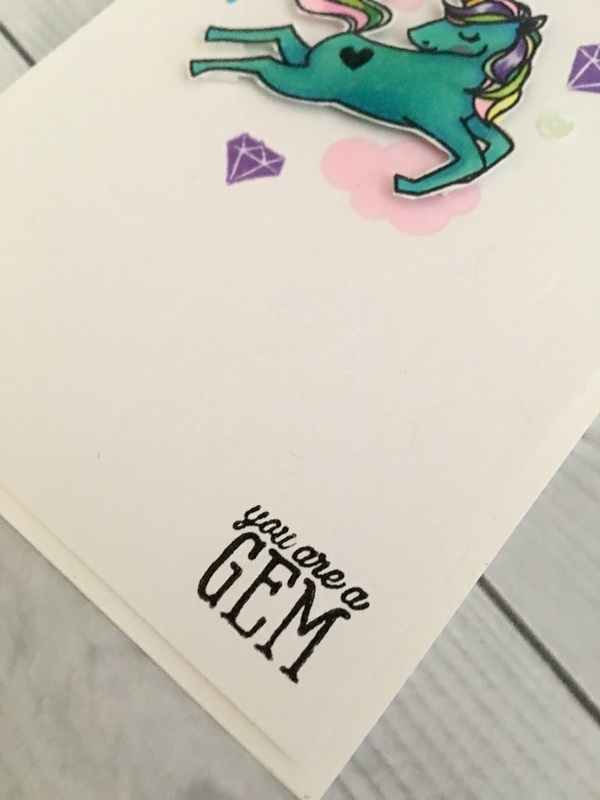 I saw the sentiment "You Are a Gem" and I immediately knew I wanted to use it for my thank you sentiment. I first stamped the unicorn on a scrap piece of card stock and colored it using my Copic Sketch Markers. I tried a light blue color at first but I don't have many light blue colors that blend very well together. So, I moved to a blue-ish green and I have to say, I'm happy with it. I colored the hair in different colors to bring more interest to the unicorn since I knew this would be a simple card in all other aspects. I then cut her out using cutter bee scissors. After positioning the unicorn without adhesive where I thought I may like her, I placed the cloud stamps beneath her and the gem stamps around her to create my scene. 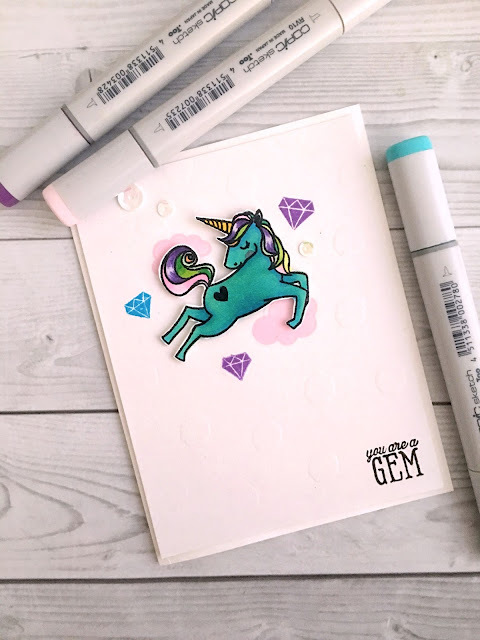 I took the unicorn off and using my WRMK Precision Press, I closed the door to set the stamps, inked them up, and then stamped them exactly where they had been before. I would be a very, very, sad girl without my precision press. Then I inked up the sentiment in Versafine black ink, and stamped it on the card stock in the bottom right corner. I didn't want the sentiment to be the focal point of the card, but it was important that it could be seen easily because of the pun. I do love a good pun. I then put some foam tape on the back of my unicorn to give some dimension and set her right into place. I grabbed some iridescent sequins in two different sizes and placed them near and around the unicorn for a little extra sparkle. I adhered the card stock with Glue Dots tape runner to a white 110lb card base. And voila! This is also my final card for my Clean & Simple Challenge. I am actually pretty impressed by how much I like the outcome of all three cards. I'm also a bit surprised that it actually took me a bit longer to brainstorm a C&S design. Probably because I needed to make sure i stuck to the plan and didn't add too many embellishments like I love to do. Thanks for being such a gem and checking out this card. 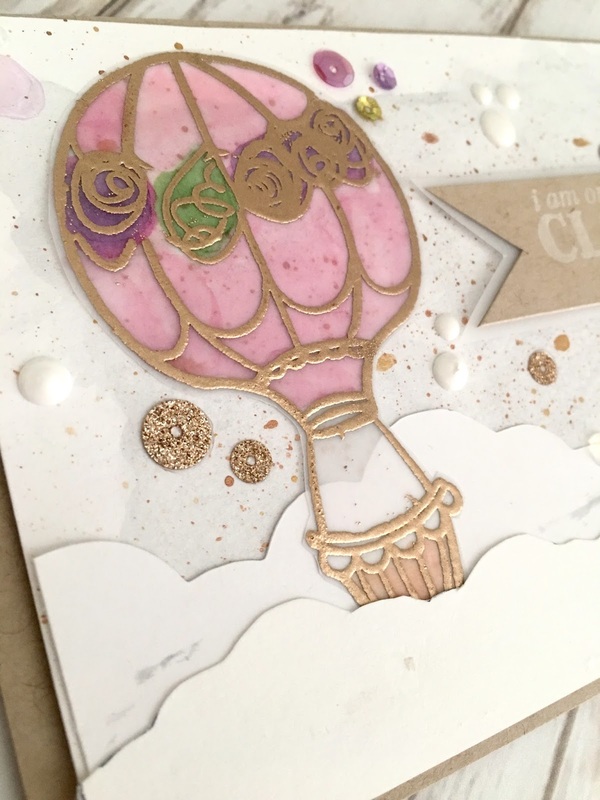 If you'd like to see my other Clean and Simple cards from this challenge click the link below. I love this 'magic' technique that I completely made up and am completely unsure if its already a thing. Hopefully you love it! I took the Mr. Bone Jangles stamp set from Visible Image Stamps and stamped them in black on black card stock to basically give it a shine / iridescence rather than an eye catching image. It's used as a pattern or background to this card stock. 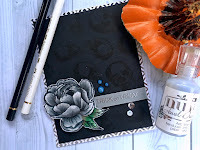 I also colored this peony from Single Peonies by The Ton stamps in black, silver, and white using Faber Castell Polychromos pencils (which are my favorite to use on dark colored card stock). 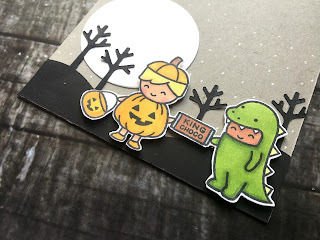 Then I heat embossed the sentiment Trick or Treat on some vellum cut slightly longer than the width of the card so that I could fold and adhere it to the back so you wouldn't see the glue through the vellum. I used Grey Mist Nuvo Jewel Drops by Tonic Studios and threw on two sequins for good measure. I had to edit the photo a bit to show the skulls since you can only see them in the right light. Otherwise it just looks black (which is pretty cool for Halloween). I hope that you enjoyed this technique and card! Let me know if you decide to use this and how it works for you! I always see the most beautiful minimalist cards and when I try to recreate them, I have such a problem stopping while I'm ahead. This week is going to be a tough one. Here's my first card. I hope this gave you some inspiration to try a simple card. Sometimes, they really are the most beautiful. Let me know how yours turned out! 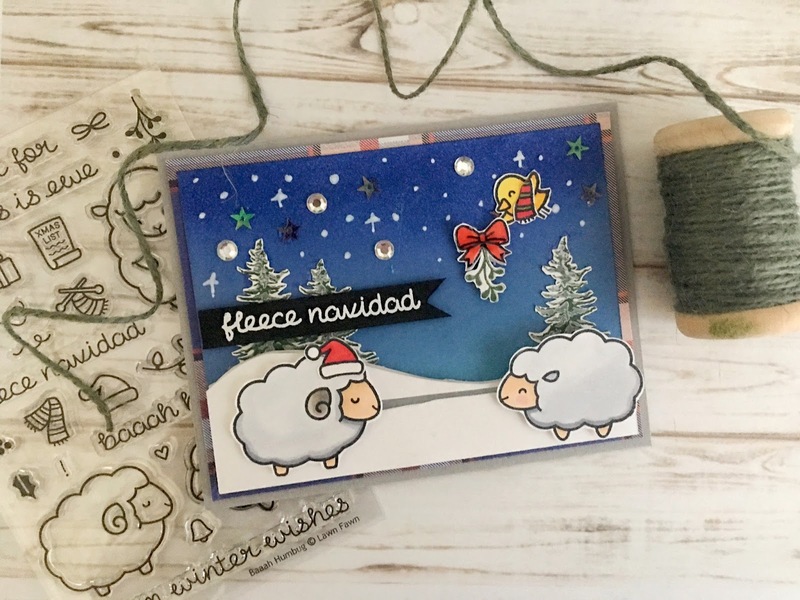 I have had this insanely adorable stamp set from Lawn Fawn since August and have yet to make a card with it. 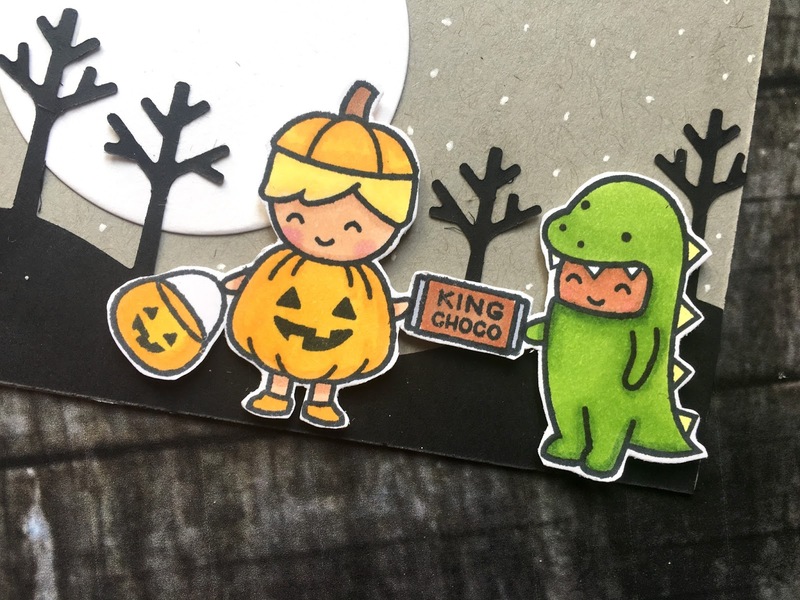 I’m completely in love with these characters, but don’t often find myself reaching to make (or give) a Halloween card. So...I didn’t. I made a Thank You card and I couldn’t be happier with it! Super simple, still Halloween-y (tehehe weeny) but completely usable and appropriate for a thank you card. 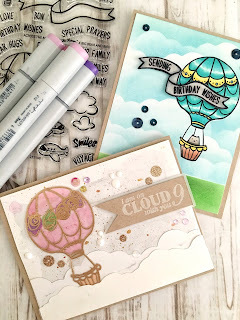 :) I love when I can find multiple ways to use the same stamp set! Todays lesson: Use that stamp set again...SERIOUSLY. I went a little out of the box for this card. Before I stamped the balloon, I put a piece of masking tape over the critter and the middle of the balloon. I then stamped the balloon in Versamark Ink and **removed the masking tape**. This is VERY important. If you do not remove the tape before making the impression, it won't mask anything. I stamped the balloon on vellum paper and added some flowers to the middle of the balloon where I masked off the middle ribbon part of the balloon.After embossing the balloon in gold, I colored the balloon in on the back of the paper as to not ruin the tips of my Copic markers with the embossing powder. I knew I had this Cloud 9 sentiment from another stamp set and I thought it would be really cute to add some cloud cutouts to the bottom of the card to give the illusion that the balloon is flying through them. 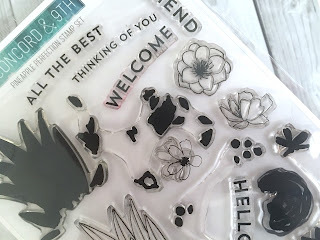 Let me know which stamp sets are your favorite to use over and over again. Full disclosure; this was my first interactive card of any kind. I'm nothing if not ambitious, but the thought of attempting a card like this freaked me out! After watching the perfectly crafted video below, I gave it a try. ...Okay, got all that? Don't worry. I watched it twice, and then again while building the slider for step by step directions. Amazingly, it was actually very doable. The toughest part for me was perfecting the size of the piece of foam tape on the penny to fit just-so in the slider space. So I just grabbed my handy hole punch. Wait, what? I do not own a hole punch...seriously. I own pretty much every other crafting/office supply item, but apparently NOT a hole punch. ugh. So I had to make my own holes which made for a not-so-great looking slider mechanism. Minor details. The point is, IT WORKS. My boy sheep slides right on over to my girl sheep and they share a smooch under the mistletoe held above by my little birdie wrapped in a scarf. Swoon. After creating a winter nights sky by blending some Distress Oxide Inks (Black Soot on the corners, into Faded Jeans, into Broken china) I added some glossy accents to the bow for a little shine. Add a good pun like Fleece Navidad (HA!) embossed on a black card stock banner, and I'm sold. I placed some iridescent jewels into the sky after dotting in some stars with a white gel pen, and adhering star shaped sequins. I love this card so much. I will be getting a hole punch very soon to attempt a prettier slider, but this will do just fine for now. My friends and family are all impressed and my daughter thinks I'm magic. Thank you for reading :) Let me know what you think and how your slider turned out! Firstly, let me just tell you my current obsessions. 1. 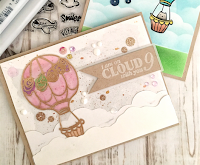 Toned Tan Card Stock - it gives SUCH a polished yet homemade look as a background. It's a little more interesting than white, yet not as distracting to the eye as a colored card base can be. 2. The Ton stamps. They are so beautiful and are great for coloring in or watercoloring. 3. Enamel dots & Sequins. All the time. Always. I need help. I chose the toned tan card stock for this card because I have been loving the way it looks with colored pencil. 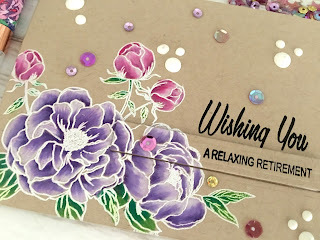 With such beautiful stamps, I knew I wanted to color them in. I colored the base of the petals and leaves in a dark tone, blended that with a similar yet lighter tone, and finished off the tip of the petal by blending in white. It gives that really beautiful rich to faded color. The sentiment is perhaps my favorite part of this card. I took a tip from Jennifer McGuire and die cut a rectangle shape directly from the card and applied foam tape to the back. 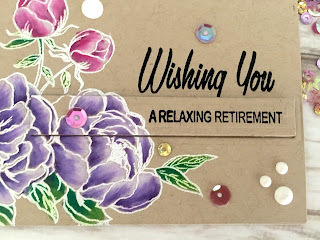 This let the card retain the full stamp and color while still highlighting where I stamped "A Relaxing Retirement". I then simply stamped Wishing You above that. Then, I wanted to embellish the card. Since the sentiment looked very simple, I wanted to highlight the card in some other way. 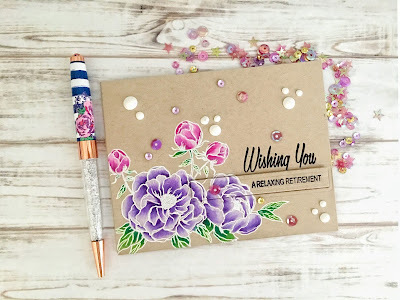 There was quite a bit of blank space above the sentiment and flower stamp. I decided to add some white enamel dots but I still wanted more. I felt it was lacking a bit of something. So, I dug into my stash and pulled out these beautiful sequins from the July My Monthly Hero kit. I placed them around randomly and adjusted them until I liked the way it looked. I think it adds a little sparkle to an otherwise very simple card. In my opinion, it doesn't take away from the flowers but adds to it with the iridescent purple color.